During an empowerment workshop in a small village in the High Atlas Region of Morocco, we asked participants to take a moment to visualize their own future. Twenty-five female participants were present in the room. None of them reacted to what we asked. At first, we thought the word "vision" was not clear to them and tried to explain it in several different dialects and languages. When this did not help, we realized that the problem was not the lack of comprehension of the language. In fact, a possible reason could have been the lack of understanding of the very concept that one has the option, the ability, or the right, to visualize her own future differently. "Feeling that one has the right to something is much more powerful than simply needing or wanting it; it implies that someone else has the duty to respond" (Green, 2012). Indeed, there are indications that rights promote development. However, could raising awareness of rights, on its own, be sufficient to promote development processes? We frequently ask ourselves why governmental decisions and national laws that promote human rights, which often influence development processes, struggle to reach remote areas. Is this what keeps marginalized societies behind in the process of development? On the quest for an answer, a team from the High Atlas Foundation (HAF) including Fatima Zahra Laarbi, Ibtissam Niri, Amina Samkane, Dr. Yossef Ben-Meir, and myself conducted a participatory assessment of needs and awareness of personal rights in 2017. The research included group discussion workshops targeting rural women of the High Atlas Region in the Al-Haouz Province. The research showed that 94 percent of study participants had never heard about Moudawana – the Moroccan law that established distinct women's rights – even though the law was enacted in 2004. Indeed, providing a legal structure, raising awareness and enforcing it, might not be enough to promote sustainable development. However, combining other participatory methods with a Rights-Based Approach (RBA) might be the key to reaching a sustainable progress. Recently, there has been an increased interest amongst different development actors and agencies in shifting to RBA, as it encompasses human rights as a central tool to promote development processes. It emerged as a distinct paradigm in the late 1990s, combining internationally recognized human rights with local development actions aimed at poverty reduction (Kindornay, Ron and Carpenter, 2012). RBA implies that participation in development processes is the right of every individual. 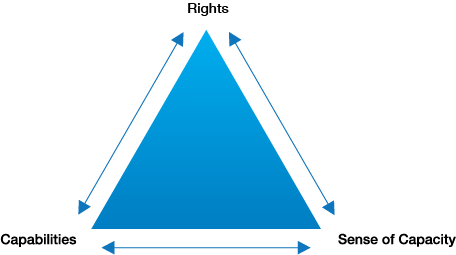 Furthermore, development, in many cases includes a process of securing access to rights and its enforcement, whereas the existence of rights enhances development processes. Based on our field research, I would also claim, that in order to maximize the use of rights-based development, it should be utilized with a Capabilities Approach and a Capacity Building Approach (Sen, 1999). There is a difference between one's actual capacities and one's sense of capacity. While the first describes the ability to use existing skills, the second discusses acknowledging its existence (Nussbaum, 1997; UNDP, 2009). These two approaches—and multiple others that are part of the participatory development framework—emphasize the important role of engaging the community in the process of achieving sustainable development and situating the individual and his community at the center of the process. The above model that utilizes rights, capabilities and capacities, can be applied in the case of women's rights in Morocco. Human rights and freedoms are enshrined in the Moroccan Constitution as "immutable constants", (article 175). In 1956, Morocco enacted Moudawana, which is entirely based on the Islamic sharia and the Maliki School. The 1956 Moudawana did not conform with international human rights law as women’s rights were not equal to those of men. However, following decades of civic struggle, in January 2004, the new family code law, Moudawanat Al-Osra (Family Moudawana), was ratified. This reflected Morocco's consideration of different restrictions and local social elements, to make international human rights laws, potentially, easier to implement in its society. The new law follows the principle of equality between men and women in family, community, and Moroccan society. It raises the minimum age of marriage for both men and women to 18, includes rights for women to obtain a divorce and inherit property, requires a women’s approval to allow polygamy, and includes other such rights within its 400 legislations. However, its implementation faces different barriers in terms of both public awareness and law enforcement, mainly in remote areas (Harrak, 2009). Using Moudawana, HAF aims to integrate a rights-based approach into its existing programs to create an inclusive women's empowerment strategy that involves strengthening capabilities, capacities, and implementation of rights. From August 2017 until January 2018, we conducted participatory research using focus groups to find rural women's level of awareness of their rights and personal needs. 204 women took part in the assessment; 193 women were from the rural Al-Haouz Province in the Marrakech Region and 11 students from Marrakech University in the urban area. As women are usually socially excluded from decision-making processes, they were specifically targeted as participants to allow a different point of view on the needs of the community. This decision corresponds with the increasing global interest in women's role in promoting sustainable development and community growth. 94% of the women from Al-Haouz, had never heard about Moudawana before, whereas all women from Marrakech indicated they knew the law. Rural women shared sentiments that if they could not learn what their rights were, they would remain dependent on their husbands, families, and communities. Moreover, they mentioned several core reasons for their lack of awareness including: lack of education, lack of access to information due to inadequate infrastructures, and social norms that stand between them and the knowledge of their rights. Additionally, three main needs were identified: strengthening women's capabilities (including literacy, financial skills, bureaucracy etc. ), developing and reinforcing women's independence, both socially and financially, and changing certain social norms to improve women's status. The needs that were raised in the discussions led to our understanding that a strong connection exists between rights, capabilities, and sense of capacity. The actual existence and enforcement of laws that secure rights allow reinforcing capabilities, whereas awareness of rights strengthens one's sense of capacity as people feel a part of a "whole" who deserve respectable treatment. 1. Create an inclusive participatory process, which involves different stakeholders from the very beginning. RBA acts as a catalyst that can transform the framework of development from focusing on providing needs, to focusing on people who can recognize and claim their rights as outlined in the Universal Declaration of Human Rights (Nyamu-Musembi and Cornwall, 2004). This imposes higher self-awareness, which provides the power to create "your own change", particularly among societies that are usually marginalized or discriminated against. 2. Encourage local leadership to promote independence and sustainability. Participatory development, according to different development entities, promotes sustainability. For instance, in our project we suggested doing so through the promotion of relationships between rural women and university students. As students from Marrakech University mentioned, "We see the issue of using Moudawana as a shared responsibility or even as a national mission." Bringing together university students and rural women to learn about Moudawana and designing suitable local implementation of the law encouraged local participation that led to local leadership. 3. Financial development is the method; social and human development is the main goal. It is common to measure development in terms of financial progress. However, through this perspective, to achieve sustainable development a program should target social and human development as well. Examining the links between RBA, capabilities approach and capacity development reveals the advantages of rights-based development and the ways it can support sustainable changes. Placing women at the heart of the process by using participatory methods provides a different point of view on community development. Furthermore, as Moudawana is based on Islamic sharia, which is highly respected among Muslims globally, it has the potential to evoke change regarding women's rights and their role in society in other Muslim countries. Throughout local implementations of international values, RBA can be utilized with other methods to support both individual and collective social change. Image courtesy of Gal Kramarski (author). Gal Kramarski holds a B.A in Middle East and Islam studies and Political Sciences, and a M.A in International Development, both from the Hebrew University of Jerusalem. As part of her masters research she conducted an internship in Marrakech, Morocco, where she worked with rural women on designing a project for raising awareness of women's rights. Her master's thesis focuses on the experiences of Palestinian students at the Hebrew University, and the connections between visual appearance and sense of belonging. Gal is a project coordinator in Manarat Center for Jewish-Arab Relations in the Van Leer Jerusalem Institute. Nov 4 Valuing Compassion: Why Can’t We Redefine Success?